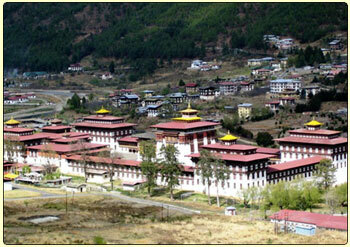 Experience Bhutan tour with experts, we offer the best itineraries with good price! The name ‘Bhutan’ appears to derive from the Sanskrit ‘Bhotant’ meaning ‘the end of Tibet’ or from ‘Bhu-uttan’ meaning ‘high land’. Though known as Bhutan to the outside world, the Bhutanese themselves refer to their country as Druk Yul or the Land of the Thunder Dragon. ‘Druk’ meaning ‘Dragon’ and extending from the predominant Drukpa school of Tibetan Buddhism. The history of Bhutan begins with 747 A.D. with Guru Padsambhava also known as Guru Rinpoche who made his legendary trip from Tibet across the mountains flying on a tigress’s back. 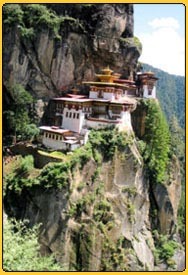 He arrived in Paro valley at Taktsang Lhakhang also known as Tiger’s Nest. Guru Rinpoche is not only recognized as the founder of the N yingmapa religious school but also considered to be second Buddha. In the ensuing centuries, many great masters preached the faith resulting in full bloom of Buddhism by the middle ages. Although sectarian at first, the country was eventually unified under Drukpa Kagyupa sect of Mahayana Buddhism by saint/administrator Shabdrung Ngawang Namgyal in the 17th century. Ngawang Namgyal codified a comprehensive system of laws and built a chain of Dzongs which guarded each valley during unsettled times and now serving as the religious and administrative centre of the region. Sikkim and Darjeeling provide excellent view of Mt.Khangchendzonga - Third Heighest Pick of Word in the Eastern boarder of Nepal Himalayas. The beautiful state of Sikkim is sandwiched between the kingdom of Nepal in the West and Bhutan in the East, Tibet in the North and the state of West Bengal in the South. With an area of 7,300 sq. kms, measuring 115 kms from north to south and 65 kms. From East to West, the elevation ranging from 244 mts to over 8550 mts. Sikkim is rich in it's culture, customs, heritage, flora and fauna. Sikkim, once a protectorate of India with a monarchy government but metamorphosed as the 22nd state of the Indian Union in the year 1975. Amidst the grandeur of the mountain peaks, lush green valleys cascading waterfalls and fast flowing rivers, beautiful monasteries and terraced hills, Sikkim offers her visitor a rare and exotic experience. Darjeeling the dream land of the East, it has been a popular hill station since the British period. The toy train coming from Siliguri is some thing which is liked by the tourist and locals equally is a real fun . It takes six to seven hours to cover a distance of 82 kms and the slow speed gives you enough time to watch and appreciate the beauty which nature has provided it. This train passes through the Forests, waterfalls, over deep valleys and through the mountains and tunnels. In this 15 days tour of Nepal, Bhutan and Sikkim Darjeeling we try to give you the best experience this 3 country have to offer in a short time. Arrival day in Kathmandu , Nepal, check into hotel and rest. Departure to Puntsoling boarder, stay in Indian side. Day 15: Transfer to the Airport for Final Departure. Namaste! Availability: Every week through out the year how ever (July - Aug) is not recommended. 4 - 5 star hotels available in the cities, extra nights can be added at any point en route, fully supported camping trek, Tailor made itinerary available ask for full range of options, Bhutan tour can be combined with India Taj Mahal tour or Tibet tour.